You have worked hard on your site. Designing it, making it unique and promoting it. Hosting companies offer backups but if you read the Terms of Service, you will see that is only a complimentary service. Kind of a favor. They don’t guarantee the backup service nor the integrity of the data. For cents a day you can have the best backup and restore service online. Your site and database will be backed up every day and you can restore it with simple clicks in case your hosting server disk frys. 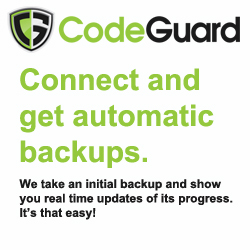 Code Guard (this will take 30–60 days) we will issue a partial refund of $15.00 on your purchase. Disclosure: we receive compensation from Code Guard for every new customer who follows affiliate link above and opens a new account and happy to pass on part of this compensation to our customers.